Austin&apos;s LGBTQ scene has it all. You don&apos;t have to look for rainbow flags or limit yourself to one small part of Austin if you&apos;re interested in experiencing everything that the city&apos;s large and diverse LGBTQ community has to offer. 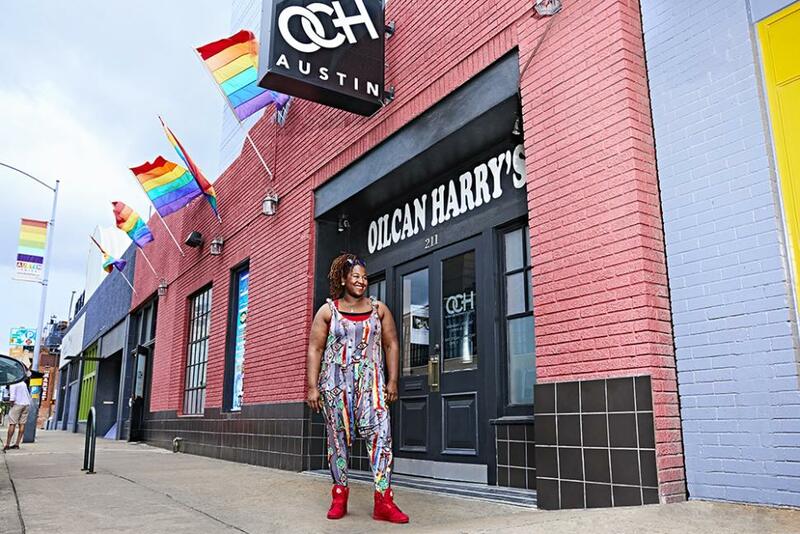 Unlike many places, which have only one or two areas known as &apos;gay districts,&apos; Austin&apos;s LGBTQ residents are truly everywhere. And proud of it! We&apos;ve also helped to build, renew and revitalize many of the city&apos;s most popular, vibrant neighborhoods. So, come along on a quick tour (you can drive, walk, bike or hop on the bus) for some of the best offerings. LaGina Harris at Oilcan Harry&apos;s in the Warehouse District. Credit Annie Ray. Prior to the opening of the gay-owned Hotel San Jose (have a frosé and people watch by the pool), the streets around South Congress Avenue were not known for very much. Now the area is beloved by locals and visitors alike-with a wide range of restaurants, shops and people dotting South Congress Avenue. Grab a cup of Jo&apos;s Coffee, peruse the shelves at South Congress Books, check out the antiques and funky finds at Uncommon Objects and when you&apos;re tired from all that walking, head over to the green hills of Butler Park to relax and take in Austin&apos;s ever-expanding skyline. While you&apos;re still in 78704, grab a sweet treat at Lick Ice Creams, a gay-owned artisanal ice cream shop that boasts flavors like roasted beets and mint. Check out the city&apos;s magnificent Greenbelt: more than 800 acres of winding trails, hiking and wildflowers await you. Head north into Downtown Austin - grab a cocktail during the superb happy hour from the resident mixologist at the W Hotel. Then, catch an indie or documentary film at the city&apos;s newest, best-kept-secret theater, Violet Crown Cinema. Tucked away above the noise of the city with a balcony overlooking the street-scape, the theater boasts four screens, a restaurant and the option to bring that food and drinks into the theater-how cool is that? Courtesy of Cheer Up Charlies. Speaking of cool, East Austin is arguably the city&apos;s hottest neighborhood. This historic area, brimming with art galleries and unique local businesses, has a wide range of funky shops and restaurants. Best of all: it&apos;s totally walkable. One spot that epitomizes the quirky nature of Austin&apos;s Red River Cultural District is Cheer Up Charlies, a cute, lesbian-owned bar and music venue with an adorable backyard that&apos;s serviced by two food trailers. Cheer Up Charlies showcases a diverse range of acts and themed dance parties, billing itself as welcoming the LGBTQ (and straight!) community. If you want Austin&apos;s take on the club scene, Oilcan Harry&apos;s, Rain on 4th and the Iron Bear are your best bets. This city is also full of fit, athletic types and sports fanatics. That extends to its LGBT residents. Choose from a multitude of gay or lesbian sports leagues and teams, whether it&apos;s soccer, softball, tennis, basketball, rugby, volleyball or bowling. There are two options for Pride parades and celebrations, with distinct vibes, in June and September. Looking for a guide to the city&apos;s gay-friendly offerings, as well as a window into the accomplishments of its gay/lesbian community? Check out L Style G Style, a lifestyle publication that profiles gay and lesbian innovators, leaders and influencers, from Whole Foods Market, Central Market or one of many locations in the city. More information on this publication can be found at: http://lstylegstyle.com/ or on Facebook (https://www.facebook.com/LstyleGstyle) and Twitter (@LStyleGStyle).